The main event at the Bermuda Regional is the four-session Knockout that's held Monday through Thursday across the afternoons. This is a truly international event - this year's KO featured teams from the USA, Canada, Bermuda, England, and Austria! Our toughest competition came from the Hansen team, all from Austria. 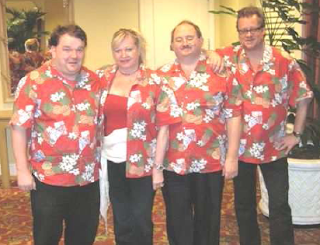 They had a great showing in the North American Swiss Teams at the Honolulu NABC a few years ago, so they showed up for the KO wearing their lucky Hawaiian shirts! 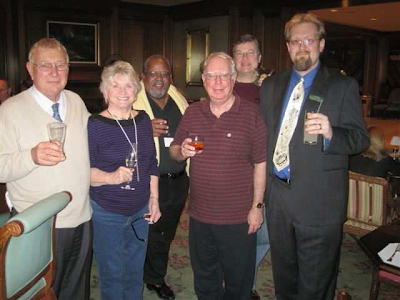 Bill Souster started with the king of clubs. 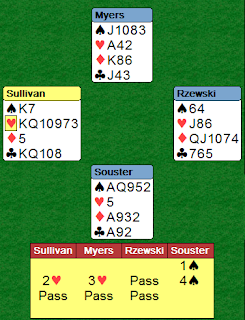 I played the discouraging / suit preference / whatever three of clubs, and Bill dutifully led a diamond, which I ruffed. 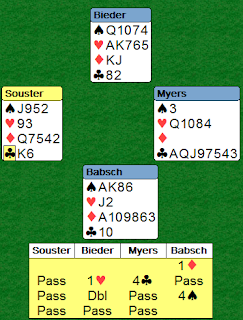 I attempted to cash the ace of clubs, but Babsch ruffed with the king. 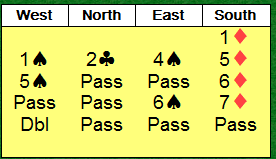 He now led a spade to the ten, holding, then overtook the king of diamonds with the ace! He pushed the ten of diamonds through Bill, ruffing on the table when covered, then came back to the ace of spades. He led winning diamonds through Bill, and eventually he took his one trump trick and conceded. Well done! 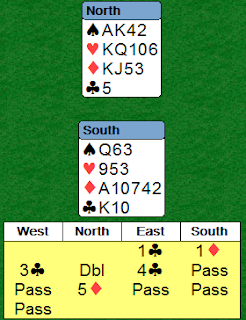 My teammate Ian Harvey played the hand along similar lines, but was playing from the North side - so didn't have to deal with the diamonds ruff. Well played Andreas - tough way to lose an IMP! I gave Bill a very pushy limit raise, and he had an easy raise to 4S. Margie led the king of hearts. Bill saw that it would be easy with a winning trump finesse, but that lost. He ruffed the heart return, drew trump, cashed the ace of diamonds, and led toward the king of diamonds. 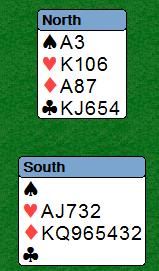 He was hoping to find a 3-3 diamond split for a club loser... but Margie's discard dashed that hope as well. 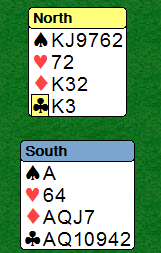 He saw one chance, and took it: he won the king of diamonds, ruffed the last heart from the dummy (eliminating that suit from both hands), and led a low club toward the jack. Margie was stuck - she won the queen of clubs and had to either lead away from the king of clubs or give Bill a ruff and discard. Way to go! Thanks to Barry Rigal for some of the pictures.